EXPLORE THE 8TH GRADE CURRICULUM. A continuation of our nationally recognized reading program includes in-depth novel and shorter text studies. Class discussions to analyze text take thought and response to higher order thinking as the core reading components of English Studies in eighth grade. The importance of advanced Socratic questioning in the analysis of student reading as well as the value of pairs and group discussion of literary works and genres are evident in eighth grade. Class novels for literary analyses lend themselves to discussions about tragedy as well as the discovery of young protagonists and antagonists. The year will culminate with a poetry unit that highlights American poets throughout history and a capstone research paper focused on cross- curricular topics. Literary concepts such as foreshadowing, symbolism, irony, focus, novel organization, figures of speech, plot and dialogue analysis and critical peer review will be woven into the novel reading and discussion. Writing will have a dual focus in eighth grade. The actual mechanics and grammar of writing will be fine-tuned using actual novel selections and texts. These will lead students into using advanced grammar texts such as handbooks and manuals to guide quality and noteworthy writing. Advanced sentence and paragraph structure, essay format, rich vocabulary practice, and personal writing style will then lead into the actual creative writing process: pre-writing activities, drafting, revising, peer evaluation exercises, and sharing quality work. Utilizing laptops will provide students ample opportunities to continue skill building through word processing, presentation programs, and online research. Online safety and protocol will guide all use of applied technologies and social communication. Oral communication will be bountiful as students deliver oral peer evaluations, share quality work, prepare and deliver short speeches from the special Wood Acres podium, and practice the merits of productive critical conversation to debate topics and issues. Socratic questioning used liberally in Wood Acres’ program also enhances a student’s savvy in learning to speak well and confidently in front of peers, teachers, and a wider public audience. The tenets of debating will help raise this Upper School student’s natural ability to argue to a new and celebrated level! Vocabulary will be taught within the context of our challenging reading with an additional focus on the advanced study of etymology. The emphasis on Greek and Latin roots will allow students to enhance vocabulary acquisition, appreciate the roots that link world languages, and become more adept at deciphering the meaning of their ever-growing adult spoken and written vocabulary. Obvious benefit to verbal performance on upcoming PSAT and SATs in high school makes this a worthwhile course of study. The power of language is also studied in cross curricular social science and English studies discussions. Correlated to the National Council for the Teaching of Mathematics Focal Point standards, Wood Acres algebra curriculum is a 21st century, systematic, rigorous program that provides in-depth coverage of proportionality, formulas, linear equations, functions, and statistical analysis. Relevant and interesting problem solving, integrated in every lesson, is the foundation of a solid mathematics course that perfects algebraic thinking. Three types of enrichment lessons such as acceleration, expansion, and extension help deepen student understanding of and appreciation for the power and beauty of mathematics. Prescriptive assessment throughout the program gives teachers real help in tailoring instruction and practice to benefit students. Robust online support exists for teacher, student, and families as all review and increase their algebraic competency and deep understanding of what it means to not just solve equations, but to actually create them from real-life scenarios. Algebraic study includes rational and real numbers, expressions and equations, polynomials and factoring, linear functions and inequalities, ratio and proportion, dimensional geometry and computer applications, data analysis and statistics, and probability and logic. Expressions, operations, functions, and equations of algebra will encompass the second semester as well as an introduction to trigonometry, ratios and proportion. Use of algebraic software specific websites will continue to build integrated educational applications for our young adults. More commonly referred to as Social Studies, Wood Acres considers each component important enough for academic consideration on its own merits. Based on the National Geography Standards established by The National Council for Geographic Education, student knowledge of where we are in time and space is a vital life skill in an ever-shrinking global community. Geographic skills are covered directly and focus on global mastery of the Eastern and Western Hemispheres in eighth grade. Further student learning is focused on history, economics, culture, ethics and belief systems as well as social and political systems. Civic understanding is fostered through studies of national identity, Constitutional heritage, current events, and citizenship. Each area of study is enhanced with study skills, visual learning, map and globe work, and class participation. Vocabulary development is vital to the conversation of the social sciences as well as student work in research with primary sources, artifacts, and retrospective analysis of historical events. American history comes alive in eighth graders’ study through their text which is also available to our students online. Students are continuously challenged to answer essential questions and focus on the “whys” of history as opposed to simply memorizing dates and events. Eighth graders embrace a global perspective, engage in on-going historical dialogue, draw comparisons of events of the past and those of the present, and take away a deep understanding of American history. The eighth grade late spring capstone trip to Spain to study at The Universidad de Pontificia is truly a life changing experience for these fortunate students who see their content learning areas blurring into once-a-lifetime international cultural and adventure travel. Parents are also invited to travel with the students to put parent-child bonding to a whole new level. The Wood Acres School’s spiral groundbreaking science curriculum literally leaps from the mind-numbing “read the chapter and answer the questions” approach to a hand-on, experiential laboratory setting that has eighth graders truly learning and living the scientific process. Taught through integrated CELLS (Core Experience Learning LabS) curriculum modules provide in-depth study of heat and heat transfer, acids and bases, ecosystems, locomotion, friction, flight, simple machines, and a capstone inquiry at year’s end on the pendulum. Experiencing this type of curriculum demanded a state-of-the-art laboratory that truly allows each student to practice and experiment with the scientific process at all times. One visit to the science lab in Turner Hall and one will see a superior venue that exceeds the challenges of the Lab Learner curriculum. This type of science instruction also stretches student patience with trial and error, fosters both individual and partner work, and takes creative “out- of-the-box” thinking to a new level. The science-math connection is strong throughout the program and provides eighth graders with the tools to become independent researchers with problem- based projects. Our graduates will be wonderfully prepared for the discreet science classes in high school. Student scores on nationally normed standardized tests taken each year demonstrate that excellence in learning is demonstrable when teaching, curriculum, and talent intersect to form academic synergy in science. With Wood Acres’ Spanish program beginning with three-year-olds, the student of Spanish in eighth grade is quite advanced. Taught with a formal curriculum imported from Spain, the acquisition of foreign language skills is outstanding at Wood Acres. Instructional methodology includes TPR, total pupil response, which encourages students to become comfortable in speaking, listening, writing, and reading Spanish- escuchar, leer, comunicar, hablar, y escribir. Bilingual selections in the library assist students in leisure reading in a second language as well. Students in eighth grade are also exposed to the works of great Hispanic authors, artists, and pop culture stars and learn much about Hispanic culture and its influence on American culture. With Wood Acres’ designation as an International Spanish Academy (ISA) through the Consulate in Washington, DC and Spain, Wood Acres students will have the unprecedented opportunity to excel in this language and receive advanced placement in any area high school, ISA high school program if applicable, international school, or private high school. Eighth graders are more than ready to forego the traditional playground activities for a “hipper” and more age-appropriate program. Students enjoy a wide range of experiences that include programs focused on individual strength, agility, and stress reduction such as Body Pump, Fencing, and Zumba. Curriculum includes fitness, agility, strength building, aerobics, and team sports. Mental and physical fitness, sportsmanship, and school spirit all find a place in our PE program for eighth graders. The importance of physical fitness for life in tandem with academic fitness is stressed throughout the year. Taught by an accomplished artist in her own right, the Wood Acres art program for eighth graders is a natural continuation of rich curriculum of the earlier Upper School programs in sixth and seventh grades. With an ever-refined eye for line, form and perspective eighth graders blend didactic instruction with creative, edgy, and captivating art projects. Students display their pieces at a Fine Arts Show both winter and spring. A permanent student art gallery on campus encourages students to excel in visual arts projects. Students are trained to look at the world through the eyes of an artist, seeing lines of symmetry, perspective, geometry, color, balance, shading, tone, and depth as the art of nature and man’s creation. Three dimensional art, pottery, cartooning, caricatures, and abstract modern art appeal naturally to an eighth grader’s view of the social world around them. Through technology students also learn how the written word and presentations are enhanced by graphic art, photography, and digital media. Blending classic music instruction with a strong youth appeal, the Wood Acres band, helps create students who become educated audiences as well as engaged performers. All 8th graders participate have the option to participate in band and play an instrument of their choice. Students read music, perform in concerts, and learn about the culture surrounding the music they study. Performance band is both part of the academic day and is also offered as optional private study. Band concerts give students ample opportunities to prepare and perform in front of live audiences. The Wood Acres School is one of only a few private schools to offer band during the school day and as part of the student tuition (students rent or purchase instruments). Wood Acres is also proud of the caliber of the teachers in our music program who are talented performers and musicians in their own right. This class meets weekly with the Wood Acres School Counselor to further develop each eighth grader’s fullest leadership potential. 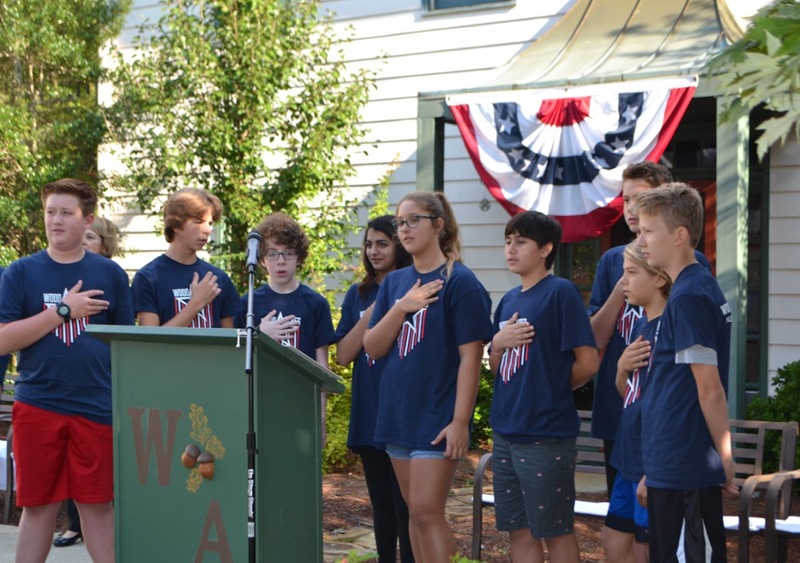 As the youth leaders of the school, eighth graders are involved in organizing, planning, designing, running, and facilitating many events and activities at Wood Acres. Students gain confidence and self awareness as they use their talents and strengths to serve their school and community. Note: While academic study is the core of The Wood Acres Upper School, we also realize the daily need for students to “chill”, relax, and catch their breaths to continue the academic day. Work on proper and acceptable socialization is key to helping our Upper School students be well educated, resilient, well rounded, and fun to be around. The sixth, seventh, and eighth grade years can be challenging, but they also can reap the greatest rewards if the entire school community is focused and committed to student growth and achievement.